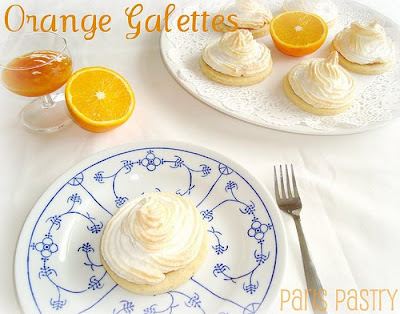 If you’re not exactly sure what a ‘galette’ is, I can tell you that these orange pastries will not make you much wiser either. 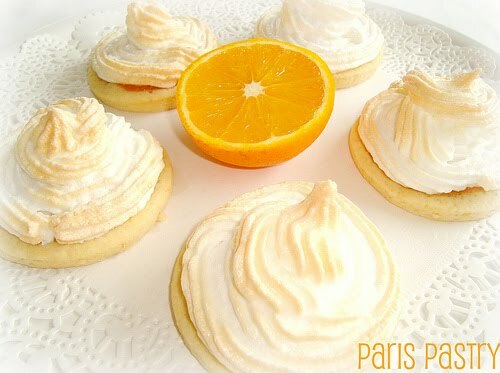 Dorie Greenspan refers to these as “an orange-meringue tart masquerading as a cookie.” I think of them as an easier and more sophisticated version of an orange mini-tart. They have a shortbread cookie base, an apricot / orange jam filling, and a crunchy yet soft meringue topping. They look beautiful, and as if you’ve spent all day slaving away in the kitchen. 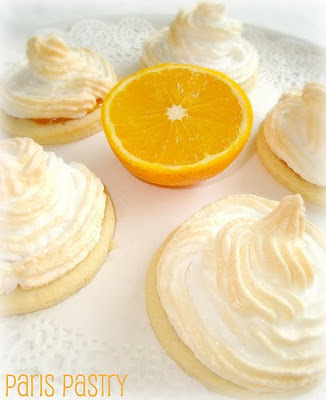 But I’ve learned that looks can be deceiving, and that’s surely the case with these quick and easy orange treasures. Rating: 3.5 out of 5. The recipe comes from Dorie Greenspan’s ‘Paris Sweets’, one of my new favorite reads. I must say I’m really starting to warm up to this cookbook. At first, I was disappointed that ‘Paris Sweets’ doesn’t show a single picture of the recipes. No picture, no sketch, no clue what-so-ever how the pastry is supposed to look like. And while that’s fine when the recipe is just an ordinary vanilla cake, it’s quite challenging when you’re making, for instance punishments or blanc-manger, and have no indication of the end result (unfamiliar French names don’t exactly help either). But I realized that it’s all part of the fun! Not knowing how it should look like, gives you freedom to create your own version. Dorie Greenspan writes such great little tales about the pâtisseries and Paris, it doesn’t really matter if you’re ever going to make something from it; reading about the recipes gives enough satisfaction (although tasting is even more satisfactory of course). Galettes à l'Orange recipe: adapted from Maison Kayser, Dorie Greenspan - Paris Sweets. - To make the cookie base: Working in a food processor or a mixer with the paddle attachment, beat the butter, confectioners’ sugar, sugar, ground nuts, and salt together until the mixture is creamy but not airy. Mix in the egg and then the flour, mixing only until the flour is incorporated – no more. Turn out the dough, gather it into a ball, flatten into a disk, and wrap it well in plastic. Chill for at least 30 minutes. The dough can be wrapped airtight and kept refrigerated for up to 2 days or frozen for 1 month. - Line two baking sheets with parchment paper and keep them close at hand. Working on a lightly floured surface, roll the dough out to a thickness of about ¼ inch (7mm). The cookies need to be heftier than most because they will be supporting a fair amount of jam and meringue. Using a large cookie cutter or the rim of a 4-icnh (10 cm) mini-tart pan, cut out as many rounds as you can. Lift the rounds onto the baking sheets, prick them all over with the tines of a fork, and slip the sheets into the refrigerator to chill for about 20 minutes while you preheat the oven. - Position the racks to divide the oven into thirds and preheat the oven to 350ºF (180ºC). - Bake the cookies for 7 to 10 minutes, rotating the baking sheets top to bottom and front to back at the halfway point. The cookies will be pale and just firm. Transfer the sheets to cooling racks and let the cookies cool while you make the toppings. - To make the jam and meringue: Put the orange zest and apricot jam in the work bowl of a food processor or the jar of a blender and process until well combined. Add the Grand Marnier and pulse just to mix, then scrape the jam from the container and keep close at hand. - In a clean, dry mixer bowl, using the whisk attachment, beat the egg whites until they hold medium peaks. Still beating, add the sugar and continue to beat until the whites are firm but still glossy. Sift together the ground nuts and confectioners’ sugar, and, using a rubber spatula, gently fold this into the beaten whites. 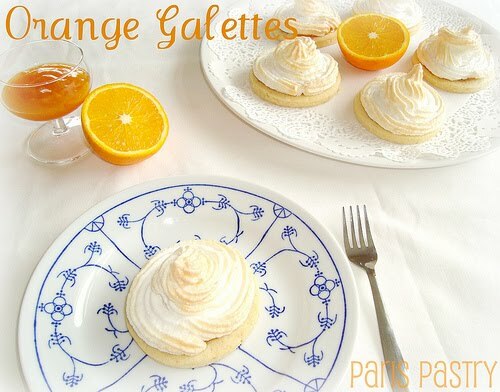 - To assemble the galettes: Using a butter knife or a small offset spatula, spread a thin layer of the jam over the cookies, leaving about ½ inch (1,5 cm) bare around the edges. Using a spoon or a pastry bag fitted with a small plain or star tip, cover the jam with meringue. Be generous with the meringue – it’s nice to have a thick swirl on each cookie. Dust the cookies lightly with confectioners’ sugar and put a bit of candied orange in the center of each cookie. 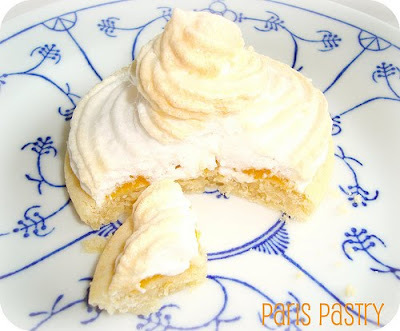 - Bake for about 12 minutes, or until the cookies are firm and the meringue is set. Carefully lift the cookies onto a cooling rack using a wide metal spatula and cool to room temperature. The cookies are best served the day they are made. On the word galette: galette means many things in French. It was originally used to describe an ancient cake, a patty of grains and cereals mashed down and baked on a sun-heated rock. Today the name is still used for flat cakes, as well as pancakes, sweet and savory; frequently used for open-faced tarts; very likely to turn up describing crêpes; and most likely to refer to a cookie, often flat, flat, flaky Breton butter cookie. These are beautiful, I love the recipes in Paris Sweets although I too was disappointed by the lack of pictures. I try not to let this put me off as some of the best books don't, Magnolia put very few pictures in their cookbooks. wow! These truly look enchanting! Even with no picture as a guide these look like they turned out perfect for you. They look good enough to be served at the Balmoral's High Tea! Beautiful!! I agree, cookbooks without photos can be intimidating...but once you start reading the stories it's even more fun to bake your own way! So cute! Ain't nuthin but a name to me, I'd take a generous bite of this jam meringue cookie/tart/galette any day.